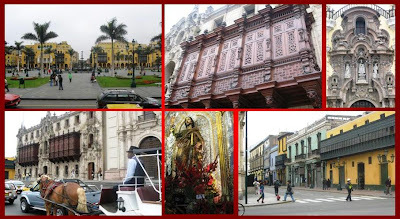 My last report from my South American trip will be about Lima, Peru’s capital. Lima is on sea level, in front of the Pacific Ocean. 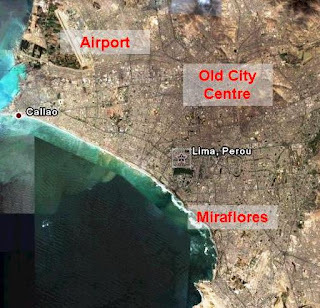 (The beaches look fairly nice, but the water is quite cold and the city’s sewage is dumped, as such, into the ocean; for nice beaches, go south or north of Lima). Contrary to the higher Peruvian areas, where the sky is blue most of the year, Lima is covered by a low layer of clouds some eight months, but it hardly ever rains. The temperature is moderate with small variations between the seasons. The urban population approaches the ten millions – about a third of the country’s total - with a very rapid evolution the last decades. In some of the outskirts, including close to the airport, there are a lot of shantytowns (pueblos jovenes), mostly inhabited by Amerindians. As many of the world’s urban concentrations, Lima has been and is growing too rapidly to allow the infrastructures to follow. 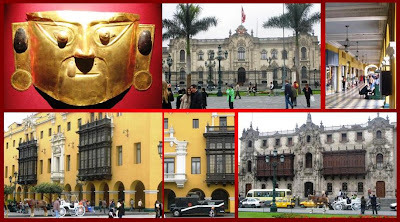 Francisco Pizarro and his conquistadors defeated the Inca population and Lima was officially founded in 1535, became capital of the Viceroyalty of Peru in 1543 and later – in 1821 – of the independent Peru. The city has suffered from different earthquakes, the most violent in the 18th century, but the old city centre is full of beautiful buildings in colonial style, especially around the central place, Plaza Mayor, including the Presidential Palace, the Cathedral and The Palazio del Arzibispo with some fantastic balconies and, close to this place, some other churches and official buildings. Close to Plaza Mayor you find the wonderful Church and Monastery of San Francisco, with some impressive catacombs where all Lima citizens were buried until the beginning of the 19th century. One interesting “detail” in the Monastery is an early 17th century painting of the Cena (The Last Supper), where you can clearly find Maria Magdalena leaning her head on Jesus’ shoulder. 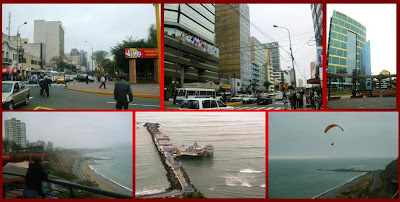 When you go to the areas of Miraflores (and its neighbour San Isidro), closer to the Ocean, the city looks almost European; wide streets and avenues, parks, modern office buildings, residential housing, hotels, restaurants, casinos…and on the Ocean cliffs a fantastic shopping and amusement centre, Larcomar. Lima has also some remarkable museums, including the Museo del Oro (Gold Museum). All nice things come unfortunately to an end; time to go back to Paris – of course also quite nice! As usual, I would suggest that you go to my photo blog, if you wish to see the photos in large! tout le charme de ce contrasme entre le moderne et l'ancien. J'aime beaucoup cet immeuble. There are some beautiful buildings there, lovely architecture. But I always hate to hear how these South American cities were founded. You always do a superb job, Peter, of explaining history, geography, sociology, etc. Now I'm ready to go to Paris again! mais je suis TROP JEUNE! Incredible photos again. I think you could make this retired life, professional, if you wanted too. Le contrast entre le vieux et le moderne est mieux organisé à Lima qu'à La Paz, mais peut-être avec moins de charme "folklorique"! When the Spaniards arrived in the 16th century, the philosophy about how to found a city and a state was clearly different from what we would recommend today! Ca ne vas pas durer éternellement! Thanks for these kind words! I don't know if I wish to be "professional" so soon again! Just started enjoying being retired and (relatively) free! 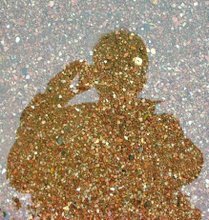 I thought maybe your blog allows a few questions about politics matter, that's why I am here -as no allowance in my own. I see that you've travelled more than me till today. If so, may I kindly ask you where starts the borders of Europe? In other words, where to where Europe lie down? Lima seems full of contrasts and contradictions! Surrounded by shantytowns...and still one of the fastest growing economies! Full of beaches and palm trees...yet cold and cloudy 8 months out of the year! et hpy qui se plaint d'être trop jeune, c'est le comble! I think that the geographical definition is quite clear. You say yourself that crossing the Bosphor, you are passing from one continent to the other... This would leave countries like Turkey and Russia partly within Europe, partly not. I guess this is not the issue, but rather the membership in EU or not. Here the opinions may vary as well on the candidate side as on the EU side... and within EU it may be different from one country to another. This has also e.g. an influence on Turkey's attitude towards the different EU countries... This is in what I was interested. Yes, full of contrasts, but clearly less "folkloric" than La Paz. This has been a marvellous journey, Peter. Thank you for the guidence. Je passe mon temps sur tes photos pour en admirer le moindre détail, mais je n'ai plus le temps d'y mettre des commentaires. Le temps passe trop vite, tu seras vite vieille HPY!! I don't want to clutter up your space with my comments about my blog, but the oldmanlincoln.com site should be black all around the outside in all cases. I don't know why you have to write everything on one line. 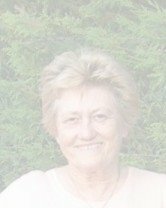 I have asked my wife, Patty, to leave a message and see if it works that way for her also. Thanks for your patience. Yes, it was a marvellous journey! I dreamt about for long, now it's done... and somehow told! C'est bien de pouvoir bien dormir... . En général je crois que tu te couches tard et te lèves tot; alors profites! You are always welcome here, for any reason! I do NOT want to be included in your ''one-sided'' political game. It would be only waste of time to talk politics with someone who is insufficient in history. In all, we are an European country, and this will be officially confirmed by Turkey's candidacy very soon. Turkey's population is 75 million people. An advice to you, jump into politics blogs and fight there with Turkish people, as they are pretty ready to tell the truth. Good luck to you. PS If you still insist to leave your own comment(s) here after me, be sure I will not follow up to reply you! I know that a lot of people now are Facebook fans and I have also been partly "bitten", but it's nice of you not to forget about blogging, including your own blog! This looks like a very clear message! However, I don't know what you mean by one-sided. I asked a kindly intended and non provocative question on your blog and it seems now to me that the "one-sided" statements are rather coming from you, talking about THE truth! If I'm insufficient in history, may hope was rather that you should clarify things - no reason to get upset! ... and I have no intention to "fight"; not in my nature! If you wish to "censor" me and others on your blog, please feel free to do so, but I have no intention to "censor" on my blog, as long as people remain polite and decent! J'aime beaucoup le masque, mais c'est pasparce qu'il est en or. Parce qu'il brille !!! Non... Parce qu'il est très figuratif et qu'il a de belles oreilles. 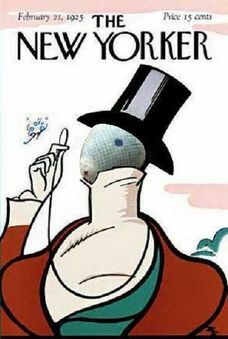 Tout n'est pas or qui brille, ce masque oui! One-sided means: as you would like to play a ''provacative politics'' game with me, but I do NOT want to be a part of your ''not-good game'', OK? Capisce? Enough clear? 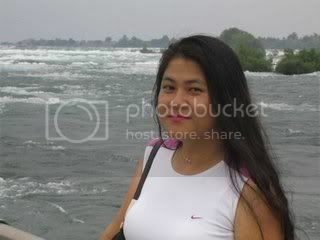 Last word to you: Fulfill your heart with ''PEACE and LOVE'' before too late if you want to live long. That would be nice for your heart health. If you do so, then you would have a chance to see ''in-person'' our all Europe-wide Red and White Republic Day celebrations, not only here but there in the heart of Europe. Study some more history, as it seems that you do not know Europe borders where to where. Guess shame on you. Peace always wins! Peace is the way and comes within, do not forget. PS I am pleased to see that you do not leave any comment in my journal. Your "peace and love" message is very clear, although I feel you could have addressed to yourself! No idea to put any message on your blog, it would censored and disappear anyhow! Bye, bye!! Wonderful photos, Peter! Love those series! I have the same opinion of Oldmanlincoln. Sure, I think you could have a great career as photographer. The painting Last supper is interesting. I really wanted to see the Mary Magdeline picture. I beleive also it was interesting and somehow surprising to find Maria Magdalena on a painting like this, so obviously leaning her head on Jesus's shoulder. Think about the DaVinci code...! Still talking after my leaving?? Not polite action! YES I do cencor as long as I feel any kind of bad-mannered NOT peaceful actions/ideas from someone else. I never allow if someone would like to be a mixer in my ''peaceful lovely home''! Unfortunately I experienced this with You! Sure it's a world, full of both good and bad-thinkings. GoodBye. I take the liberty to write what I wish on my blog and I have not "censored" your messages! Still surprised by your reaction... but if you wish to write or comment something more here, please feel welcome!